T-minus one week until we’re all stuffing our faces with turkey and pie, then taking a quick nap before digging into the leftovers. But if you just can’t wait that long for the very best part of the holiday feast—the day-after leftovers sandwich—these fine establishments will get you a Thanksgiving sandwich right now. Why do we love the leftovers sandwich so much? There are only so many days of the year most of us can get our hands on roast whole turkey, instead of the thin-sliced deli stuff. Cranberry sauce is a brilliant sandwich condiment that’s similarly seasonal. And while carb-on-carb action can seem a little excessive, a layer of stuffing on your leftovers sandwich is simply mandatory. The bread: Whatever you can get your hands on—a hero roll will do nicely, but white toast or leftover dinner rolls will do in a pinch. It’s all about improvisation. The filling: While turkey is the only truly obligatory component, a Thanksgiving sandwich sans stuffing is an embarrassment. Pile it on high. Cranberry sauce is the ideal condiment; a thick layer of mayo is its best friend. And from there, the only limit is your imagination. Where to get it: Your place, next Friday—or one of the sandwich shops below. 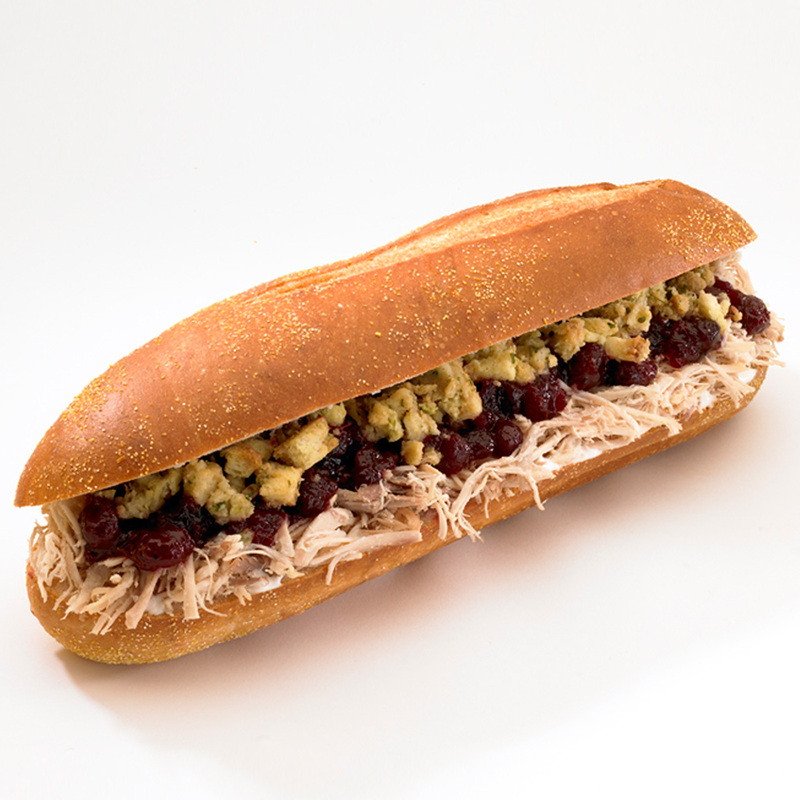 Capriotti’s Sandwich Shop; Delaware and beyond: This Delaware-based chain slow-roasts turkeys at their locations each and every night, so there’s always a Thanksgiving sub at the ready—they call it The Bobbie, with turkey, stuffing, cranberry and mayo. Silver Cloud Bar & Grill; Chicago: Expect neatly stacked layers of turkey and stuffing, with cranberry and mayo, all on white toast sliced on the diagonal. Parm; NYC: This New York sandwich shop has been famous in years past for its Thanksgiving Special, with the excellent roast turkey that graces its year-round turkey sandwich, along with sweet potato puree, fried sage leaves, cranberry and mayo.